After all the hard work we put into our new Dripper, we were eager to hear what our friends thought of it. This winter, we visited three of them—Samin Nosrat, Yi-Ling Yang, and Michelle Ott—for a cup of pour over in their own homes. While only one of our hosts is a barista, all three were able to combine the Dripper with another of our recent inventions, Perfectly Ground, to make a stunning cup of coffee. "Is it just me or are the filters made of magic and rainbows?" 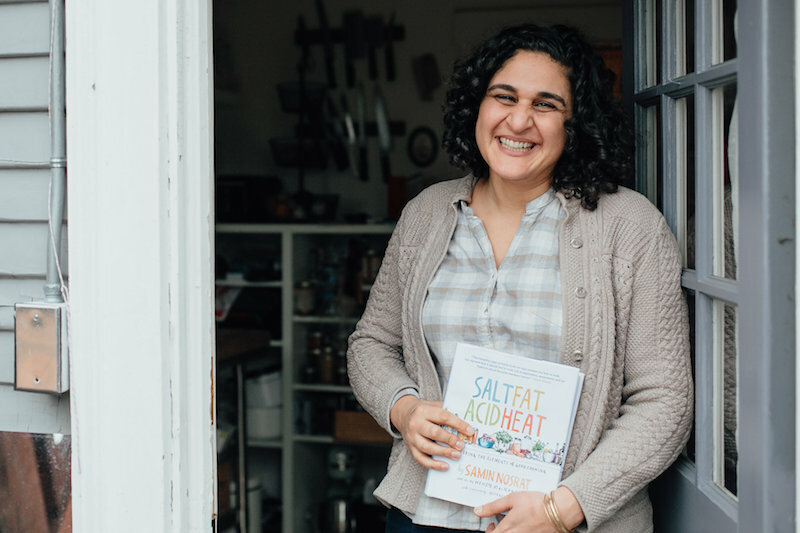 Samin Nosrat is a writer, teacher, and chef based in Berkeley, California. She's best known for her infectious laugh, teaching Michael Pollan how to cook, and for her writing in publications including The New York Times, The Guardian, and Bon Appétit. Her first book, Salt, Fat, Acid, Heat, will be published this April. "I make coffee every morning—just one cup—and I am a total amateur. But I'm an amateur with a taste for good coffee, which often poses a problem. I've tried every single fancy boondoggle and doohickie out there, and though I do sometimes get it right, my inability to produce a consistently good cup of coffee is extremely frustrating. Before getting my hands on this dripper—and is it just me or are the filters made of magic and rainbows?—I was using a $160 contraption meant to make a single cup of coffee each morning. The inefficiency of the whole operation was upsetting. Then, I met the Blue Bottle Dripper. No more wetting the paper. No more prayers before brewing. No more weighing my water before I've wiped the sleep from my eyes (wait.... Am I still supposed to weigh the water?). And yet, somehow … a delicious cup, every morning. And it's portable. And I can move the big coffeemaker over with all of the other doohickies in my coffee graveyard. Halle-fricking-lujah!!!" "The extraction feels almost fail-proof because the shape combined with the sturdiness of the filter makes it very easy to have an even extraction, cup after cup." The seeds of coffee obsession were planted early on for Yi-Ling. She grew up in Taiwan with a family that has always enjoyed coffee for its taste rather than the caffeine. Even now, her trips back home are all about coffee shop-hopping with her sister in Taipei, and her mom can out-geek her on coffee any day. Yi-Ling discovered Blue Bottle in 2006 while going to school in Berkeley. She likes to describe it as a first-love sort of sentimentality. The existence of good coffee finally made the Bay Area feel like home. While she still enjoyed checking out different coffee shops, Blue Bottle remained her favorite. Years later, when she saw a barista opening, she wondered why she'd never thought about it before. She had been working at a pediatric office for years but going to school for interior architecture to figure out her next steps. Being a barista was like a dream job for her, but without any prior experience it felt impossible to get started. But three applications and three interviews later, she joined Blue Bottle at the Mint Plaza cafe in 2014. One thing led to another, and she is now the Cafe Leader at the Palo Alto cafe. For her, the new Dripper didn't feel all that different from the old one at first, which made the transition completely seamless. But the subtle differences have a profound impact: There’s no more wasted water on rinsing out the Dripper and no more pre-wetting or folding the filter for every cup. More importantly, the extraction feels almost fail-proof because the shape combined with the sturdiness of the filter makes it very easy to have an even extraction, cup after cup. And the coffee? It’s delicious, of course. "Truly, I would happily be a barista for the rest of my life, because working in coffee doesn’t feel like work. The beauty of coffee never ceases to amaze me—whether it’s watching the coffee bloom, or that moment when espresso converges into a syrupy stream, or learning about the people connected by farming, roasting, making, and drinking it." "The coffee seemed to drip at a quick rate. It was simple to make two cups and be able to enjoy both hot coffees at the same time." Originally from Minnesota, Michelle Ott lives and works in Oakland. In 2007, she started working in the office at Blue Bottle Coffee and eventually her handmade signs and notes in the roastery became illustrations of coffee-making tools and coffee-drinking spaces that are used across the company. Michelle’s illustration and artworks begin with a focused observation of the objects and conditions before her, which become drawings, photographs, quilts, prints, and one Postcard Machine (Possibly from the Future). One of her primary sources of influence is the twenty-two nonconsecutive months she has spent living and working at McMurdo Station, Antarctica. She considers herself a pragmatic optimist. See things at michelleott.com or on Instagram. "In our home we have a morning hot drink ritual, which includes coffee or tea. But if we get up extra early (before 6 am) we call it 'continental breakfast,' which always includes the hot drinks and sometimes a little snack, or pre-breakfast, to get the day started. With the Dripper, the coffee seemed to drip at a quick rate, making the cup faster than I recall drip coffee before. It was simple to make two cups and be able to enjoy both hot coffees at the same time. The coffee itself tasted delicious. I typically enjoy fairly heavy-bodied coffee. This cup had a really soft but still substantial feeling in the mouth, and I love that kind of drink."